As the Philippine Elections is drawing near, politicians and aspiring ones are making their presence felt discretely as early as now. You will be surprised to know winning elections involve strategies that does not require spending millions. 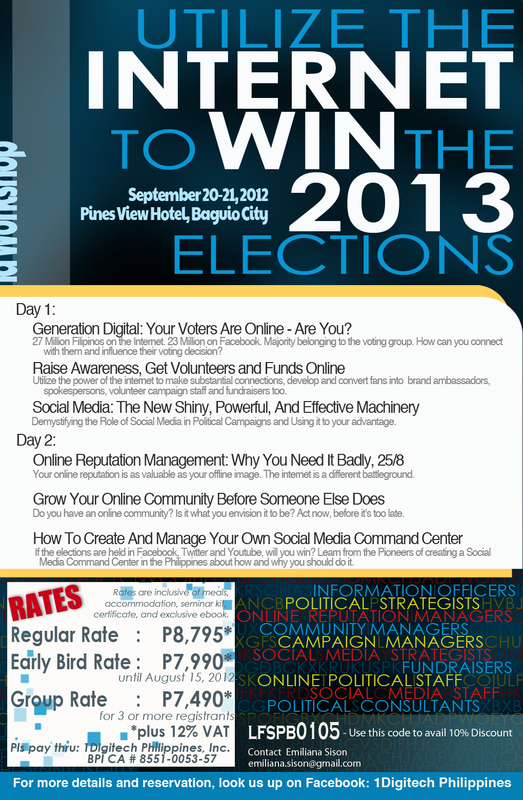 Join in "UTILIZING THE INTERNET TO WIN THE 2013 ELECTIONS” which will be held on September 20-21, 2012 at Pines View Hotel Baguio City. This workshop for leaders, information officers, political strategists, digital PR companies, social media managers, social media staff and political consultants. It will be conducted by 1DigitechPhilippines Inc. aimed at gaining the trust of the Filipino people in selecting trustworthy leaders. By building online reputation, winning the 2013 elections would not require spending millions. Since the Internet is the leading used media worldwide, raising awareness on who and what you are will make it easy for voters to recall your name during election time. There are billions of people in this digital age. Facebook alone has one billion users regularly visiting the site to communicate and socialize with colleagues, friends and family. Other sites like twitter, Linkedin and Pinterest, are also gaining more and more subscribers worldwide. Indeed, these sites are a global market haven that gives anyone a voice in cyber world. Did you know that the first election the internet won was that of US President Barack Obama? Obama pioneering use of the internet strategy turned millions of supporters into an army of volunteers and donors. His twitter fans voiced their opinion about his kind of candidacy and it has proven to be decisive. People from all over the world use the internet to sell, to influence people, to funds etc because promoting on the internet is almost free. You can use it too to grow your social network and eventually win the 2013 elections. How? Hire online reputation managers who can effectively deliver your needs. Attend “UTILIZE THE INTERNET TO WIN THE 2013 ELECTIONS” seminar It is the first of its kind seminar. Learn from the experts! Please feel free to use PROMO Code LFSPB0105 to take 10% OFF your registration fees. I like this idea of maximizing online to determine the right people who will lead our country. If only the success of internet voting can also guarantee the good and righteous performance of the leaders we are to elect. Pnoy used internet in his last campaign and it worked. It's one of the best local case studies that you may want to present in the event. Anyways, I hope this event will be successful. The internet is now a great tool to promote awareness with the candidates. Interactive sites can largely help a candidate show his views and platforms.